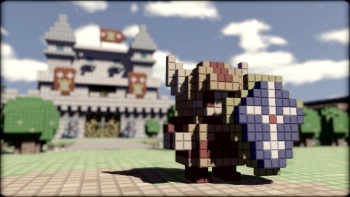 3D Dot Game Heroes, the pixely PlayStation 3 Zelda-like RPG, is definitely coming stateside. The SonyPlayStation Twitter account recently tweeted: "No need to import - 3D Dot Game Heroes for PS3 is DEFINITELY coming to NA! Spread the word, more to come." This is great news for fans of RPGs and odd-looking Japanese games. Soon to release in Japan, 3D Dot Game Heroes is in development by From Software and graphically uses 3D pixels to render everything in the game. When enemies are killed, they explode into showers of these cubes. The game is extremely reminiscent of Zelda, whether in homage or straight rip-off, with the main character throwing bombs and boomerangs as he traverses dungeons. Joystiq found out that SCEA is not the game's publisher, the guilty party simply allowing this announcement to be leaked over the SonyPlayStation Twitter account. I have my theory, however, and it's not the least bit of a stretch: Atlus. Atlus recently scored a big hit with Demon's Souls, another PlayStation 3 RPG developed by From Software. Before Demon's Souls came out, Atlus called the game's collector's edition the "stop importing it" edition. It seems to me that this time Atlus wants to stop importers right away. Atlus also publishes lots of RPGs, so the company is definitely one of the most likely choices here.